Autodesk’s SketchBook Pro has emerged as one of the staples of the art world — a cross-platform pro level sketching and painting tool that spans the range from casual scribblers to seasoned illustrators. The newly released version 7 augments the app with enhancements such as perspective guides, a new Flipbook mode and an assortment of workflow improvements. And now Autodesk has introduced a subscription model catering to several tiers of users. You can purchase a standalone license for SketchBook Pro 7 or choose from monthly or annual SketchBook memberships. Anyone can start using the desktop SketchBook software for free. The “starter edition” provides tools to create basic drawings and acts as an introduction to the software for new users. A free SketchBook membership gives you SketchBook Essentials, a suite of tools featuring layer management, a full color palette, brush customization, dynamic symmetry and ruler tools for advanced drawings and illustrations. Beyond that, a paid membership of either $24.99 per year or $2.99 per month makes available SketchBook Pro 7 with all the new tools such as the Flipbook mode, Perspective Guides and Distort Transform features, and enhanced tools such as the layer editor with blending modes and layer grouping and improved selection tools. The paid version gives you access to SketchBook for both desktop platforms and will unlock features in future versions of the SketchBook app for iOS and Android. A standalone license costs $65. Calling up the Fisheye perspective, alongside 1-, 2-, and 3-point perspectives from a contextual menu. SketchBook Pro now offers intuitive guides for 1-point, 2-point, 3-point and fisheye perspectives so you can adjust vanishing points and horizon lines on or beyond the canvas. Strokes will snap to the grid as you lay out lines in perspective. Selections are always difficult, but version 7 offers some new selection capabilities with the addition of Polyline and Magic Wand. Selection modes let you add, remove and invert objects. Persistent Selection lets you switch layers and tools while keeping the selection active and paint within the isolated region. The Flipbook mode opens a new key frame timeline featuring onion-skinning and playback control for depicting motion. Developed in collaboration with Autodesk’s Maya team, Flipbook Animation mode lets you use a traditional animation workflow within the SketchBook interface. New dynamic gradient Flood Fill tools have also been added to the app so that you can lay out solid, linear and radial gradients, or add and remove swatches on the color slider. You can also adjust transitions and fill direction by setting the end point swatches, flipping the direction of the gradient, and filling multiple selected regions. Version 7 offers improvements to the layer editor, including the addition of layer grouping, expanded blending modes for special effects, background color and multi-layer selection. That means you can transform or position several layers at once and transform or adjust the opacity of layer groups simultaneously. The new background layer allows users to select a background color directly from the embedded color wheel in the editor window. New Magic Wand selection tool joins the new Polyline tool in this version. Users can now manipulate artwork with the dynamic Distort Transform tool. Distort lets you easily place and adjust perspective. 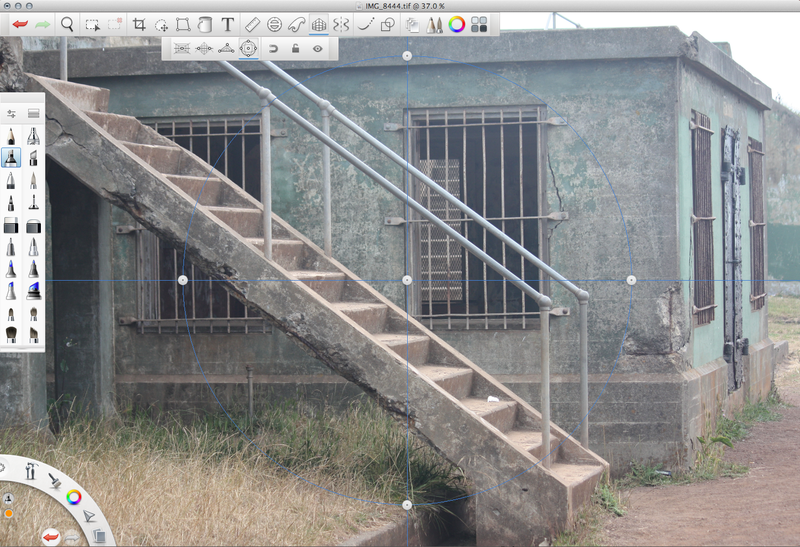 Pull and drag on the corner manipulators, or grab a bounding line to skew partial layers, multiple layers or groups. Drag the center bias manipulator to further explore the distortion. SketchBook Pro 7 works on Mac OS X 10.8 and higher, and Windows 7 and 8 and requires at least 1GB of RAM.